Doug: Say, Bronze-o-philes! Whilst leafing through some old Secret Society of Super-Villains, I came across issue #8 with art by Rich Buckler and Bob Layton. If you've never heard the story, when Jack Kirby left Marvel to go to DC, he created a character called Funky Flashman, a most-thinly veiled dig at his old partner, Stan Lee. Well, under the pencils and inks of Buckler and Layton, this character wasn't a dig -- it was the whole shovel, baby! Check it out for yourself! Oh, yeah -- and Monday's Galactus Day!! This is a nice origin story, with everything you'd want: action, odds stacked against the good guys, a likable hero who comes to his powers without too much suspension of disbelief, and some mystery super-baddies. Oh, and a cliffhanger ending, too -- unfortunately you're on your own there, as I don't have #48 to throw your way. 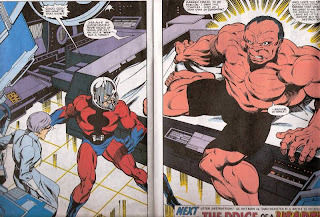 Byrne's pencils are unquestionably his, but Layton's inks give it a different look than Joe Sinnott's or Terry Austin's. This pairing is a success. Scott Lang was an electronics genius who had taken to burgling as an occupation. Upon release from his 3-year sentence, Lang was re-introduced to his daughter Cassie, 9-years old. As they got back into life together, Cassie suddenly took ill and was diagnosed with an enlarged aorta. It's interesting as scribe Michelinie has a doctor describe to Lang the laser surgery that might save Cassie's life -- what was cutting edge in 1979 is commonplace today. However, as Lang pays a visit to Dr. Erica Sondheim, who is the specialist he needs, he discovers that not only is her office being moved by some heavies but she is being kidnapped as well. Lang tracks the unsavory types to Cross Technological Enterprises, where he uses his past skills to bypass the security systems. 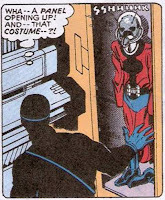 Once inside he discovers, in a scene reminiscent of Avengers #144, an Ant-Man suit. Donning it Lang finds that it's fully-functional and it's Game On! with the kidnappers. 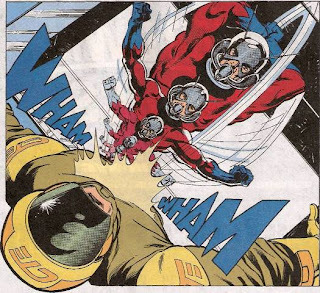 The story ends with the ringleader of the kidnappers rising from an operating table to confront Lang and to tell him in no uncertain terms that Ant-Man was not going to unkidnap Dr. Sondheim. It's to be continued (but not by me, sadly)!! Karen: I'm back with another tale of cyborg woe, from Astonishing Tales #28 (Feb. 1975). 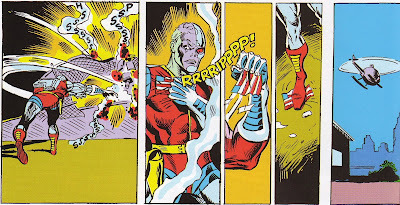 If you recall the last time we saw Deathlok he was trying to shoot himself, but found that his computer programming would not allow him the luxury of taking his own life. This issue's story, courtesy of Rich Buckler as both writer and artist, picks up with Deathlok roaming around a war-torn New York city. He surmises that, during the 5 years he was 'dead', a revolution occured, but has left the city devastated, and filled with roving packs of cannibals. While he explores, Ryker is using his spy cameras to track the cyborg's every move. He sends a tank, partially controlled by the mind of his former lover, Nina, out to destroy Deathlok. Ryker's plans have changed -"It's not a death-machine the world needs now - or an army of death soldiers as I had once envisioned - but a savior machine!" As Deathlok evades the tank, he encounters a man with a gun who tries to take him hostage, but the cyber-soldier realizes that the man isn't going to kill him and so ignores him. There's an interesting bit of dialogue as the man follows Deathlok, explaining that he is supposed to bring the cyborg with him. When Deathlok asks why, the man tells him, "The grapevine has it that there's a new savior machine built by Ryker! We -the people supporting the rebellion against Ryker - we figure you're it!" This provides Deathlok with a laugh, as he tries to figure out a way to escape from the still-oncoming tank. But our anti-hero encounters a vast wall and appears to be seconds from being blown to pieces. This issue was much improved over the previous one. Buckler gives us more insight into Deathlok's world and was has happened between the time Manning died and Deathlok was born. We discover that Manning's friend Mike Travers is still alive, but held captive by Ryker. Deathlok also begins to contemplate the idea that if surgeons turned him into the mess he is now, perhaps they could also restore him. In such a despair-filled world, the monster still has hope, which may be all that keeps him going. 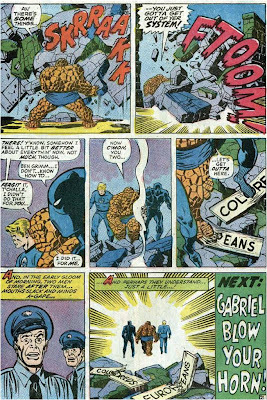 Buckler continues to push the art, including a two page section done sideways -something John Byrne would do for an entire issue of Fantastic Four many years later, but this might possibly be the first time it was done. At least Buckler seemed to think so in the foreward of the Masterworks edition. That being said, I don't think Buckler is the best inker for his art. It has a very light, sketchy appearance. However, that will change dramatically in a couple of issues when the awesome Klaus Janson begins working on the title. We also see Deathlok rip off the American flag on his chest, which I am sure had more resonance with readers in 1975 than in 2010! But the symbolism, that Deathlok is his own man, is timeless. BAB Two-In-One: Marauding Martians and the Warriors Three! Karen: I recently read H.G. Wells' War of the Worlds for the first time, so I thought it might be fun to go back and revisit Marvel's effort at a sequel -Amazing Adventures featuring War of the Worlds. The first issue in this on-going series was #18, published in May 1973. This book was a true group effort. 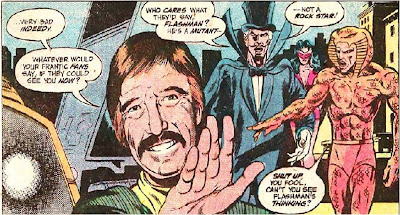 Roy Thomas conceived of it, Gerry Conway scripted it, and both Neal Adams and Howard Chaykin drew it! The basic premise is that the Martians figured out how to protect themselves from the germs that killed them when they first came to Earth, so in 2001, the aliens show up and conquer our planet. To provide entertainment, they have humans train as gladiators and pit them against one another. 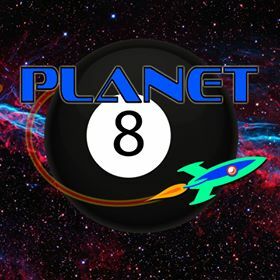 Our protagonist, Jonathan Killraven, is one such gladiator.Killraven has managed to escape and has decided to go after the Keeper, a human servant of the Martians. Karen: The story itself is mostly exposition, explaining how the Martians took over and how Killraven survived in post-invasion New York. It's not bad but like most origin stories, it just leaves you wanting to move forward and see where things are going to go. The Neal Adams art in the first half of the book is just great, although Killraven's costume is surely a solid candidate for another "fashion disaster"! Luckily, he would get a less giggle-inspiring suit later on. A text piece by Thomas in the back of the book explains how he had devised the basic concept, and Adams then came up with the plot and character of Killraven. Unfortunately he got bogged down in other assignments and so Chaykin finished up the book . His work wasn't terrible but he was no Adams! Thomas also didn't have time to write it - this seemed to have happened a lot when he was editor in chief -so Conway was brought in to do the job. Karen: Not a bad first issue as such things go. There were definitely enough ideas tossed out to make a reader curious enough to come back for more. And I will, in some later Two-in-Ones. Doug: Marvel Spotlight #30 (October 1976) is today's literary fare, kids. This really fun story was brought to the light of day by scribe Len Wein and the classic pairing of Big John Buscema and Joltin' Joe Sinnott. 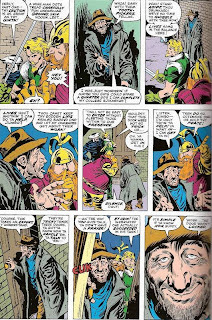 You know, part of the appeal of the Mighty Thor through the years has always been the Son of Odin's supporting cast, and none among that pantheon of gods is any more entertaining than the Warriors Three: Fandral the Dashing, Hogun the Grim, and Voluminous Volstagg! Fandral, along with his mates, laments that Thor has left them to confront Firelord (c. Thor 246-7). But then he decides to make the most of it and the three begin to scheme where and what kind of fun they might find. Hiring a cab, the three enter and bid the driver to take them to where the fun is. Wein has their voices down perfectly -- on one panel Hogun bristles over the lack of space in the rear seat, saying "I desire only a bit more room, Fandral. Our voluminous friend fairly fills the seat entire!" 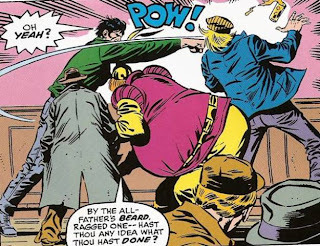 To which Volstagg characteristically responds, "Pfah! A man's girth is the true measure of his nobility!" As the cab proceeds, they eventually hit a traffic jam, gapers stopping to watch a young lady perched on a ledge as if to jump. 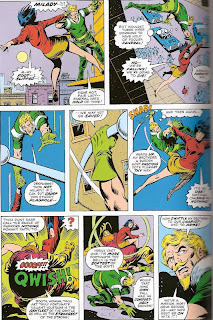 Emerging from the cab, Fandral scales the wall and eventually talks her down. The lady, Mary, was on the ledge because her fiancee, Arnold, was mixed up with some loan sharks and as a way to pay off his debts had been forced to assist in the robbery of a diamond exchange. Fandral pledged to help her to free Arnold from those bozos, so back in the cab they go. Enlisting the aid of a local wino, the boys get into the jewelry exchange and foil the burglary only to find that Arnold had been left outside to watch and had left via another cab as soon as the burgling had commenced. After busting a few skulls, the troupe piles back in their own cab and heads to the waterfront where Arnold had allegedly fled. Arriving at McGinty's, a seedy tavern wherein our story began, the Asgardians enter to a less than amicable greeting. Inevitably Volstagg touches off the brawl and it's full on. Buscema is again at his best here and just cuts loose with a lot of fun. Wein's words really compliment the pictures. As the battle winds down and finishes, the boys file back outside and who do they find but Mary with Arnold. Arnold Slackmyster, that is. Explanations are given, the couple pledges to take Arnold's story to the police, Fandral insists they find a justice of the peace to be wed that evening, and finally Fandral settles up with their cabbie. A happy ending for all; until Fandral hails another cab! What a fun story! 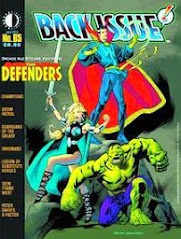 Books like Marvel Premiere, Marvel Spotlight, etc., when done with top-flight talent, prove that the done-in-one format works and even with minor characters. These sort of books were a staple of the Bronze Age and a great place to seek out a favorite B-lister. I miss 'em! 1. Karen Carpenter, the Carpenters. What's that you say? Did I hear a snicker out there? Shame on you and go dig out your mom's old LP's and check out this lovely lady who met such an untimely end. Whether it's Rainy Days and Mondays or Superstar, or the honey-dripping Yesterday Once More and Close to You, Karen Carpenter's vocals epitomized the new easy listening style of the early to mid-1970's. She was tailor-made for the diversion of AM and FM radio, maintaining a presence on what would become the "older" frequency, seemingly left behind by rock's progression into experimentation. 2. Christine McVie, Fleetwood Mac. I'll bet more people identify Stevie Nicks with the band than they do Christine McVie. And that's fine -- it was Nicks and then-boyfriend Lindsey Buckingham who made Fleetwood Mac the commercial success they became in the 1970's and on into the next decade. But McVie was there first, and continued to produce hits. Her voice was quite different from Nicks, and really fit the personality of the songs on which she sang lead vocals. Don't Stop, Little Lies, Everywhere, Hold Me, Over My Head, and You Make Loving Fun are all standards for the band, and for those who listened to Top 40 radio during the Bronze Age of Comics. College rock, my friends. Don't Go alone puts her on this list. Situation is no slouch, either. Wow -- what a voice. Big, powerful... she is truly gifted. Now I would not say I'm a Yaz (as they are known in the States) fan by any stretch of the imagination, but I could never forget some of their songs that we listened to on 12" singles, at frat parties, etc. Good stuff! 4. Chrissie Hynde, the Pretenders. The Pretenders have been a lasting act, first hitting it big in the US in 1980 with the catchy Brass in Pocket. Middle of the Road and Back on the Chain Gang got huge radio play in the mid-'80's as well. Hynde's punky, sometimes bluesy vocals are often sassy -- appropriate for the sound of the band. A side note on Hynde -- although the Pretenders were formed in the UK, she originally hails from Akron, Ohio and was a student at Kent State in 1970 during the infamous Kent State killings. Seriously -- you can't forget the intro. to Heartbreaker, Benatar's breakthrough hit. Although she slipped into video "say what?!" with her crazy dancing performance in Love is a Battlefield I'll forgive her. And despite her diminutive size (she's what, five feet tall? ), her voice is impressive. Here's your bonus -- how could I leave the Wilson sisters off the list? Straight On, Dreamboat Annie, Barracuda, Magic Man, Even it Up, and on and on. Rockers, hit makers, and let's face it -- Nancy's held up pretty well over the years. But it has always been Ann's driving, even loud, vocals that symbolize the band's sound. When I think of Heart, it's Ann Wilson that I hear first -- not any trademark musical sound. 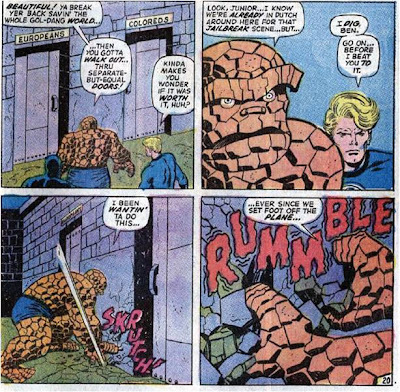 Karen: In honor of Dr. Martin Luther King Jr., we'd like to share a scene from Fantastic Four 119 (January 1972), which both Doug and I read as kids and found to be very affecting. 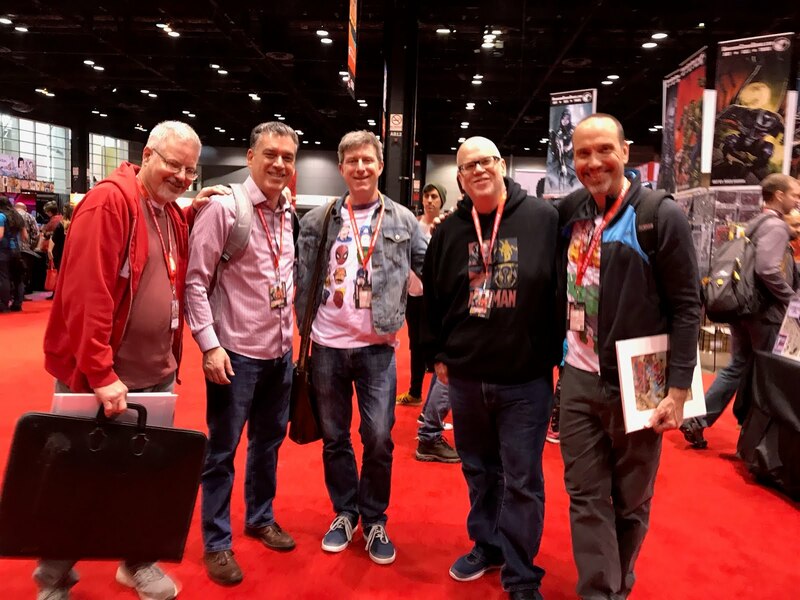 Doug: Stan Lee never shied away from making a statement, whether within the stories he wrote or approved, or within the context of his Stan Lee's Soapbox. To your left is just one example. I'm grateful to Stan for assisting in my education on these issues back when I was just a child. Karen: Agreed. The ideals Marvel expressed regarding racial equality echoed the teachings of my parents, who taught me to respect all people. As I got older, I learned of the history of the civil rights movement and it was difficult to understand how such injustice had ever occurred. Doug: Perhaps you have the day off from work, or maybe your kids are out of school. In spite of the fact that it may be inconvenient to not be able to mail a letter or use your bank, take a moment to reflect on the reason why -- today we honor a man who was willing to more than stick his neck out for what was right, and we're better for his sacrifice. Seventy years ago, Adolf Hitler couldn't wait to make war on the United States, a nation he saw as racially-diluted and weak. I'd like to think that what he saw as our weakness is in reality one of the things that makes this nation great. Karen: Our great appreciation to Dr. King, and all the courageous people who have fought for true equality and justice in our country. "Change does not roll in on the wheels of inevitability, but comes through continuous struggle. And so we must straighten our backs and work for our freedom. A man can't ride you unless your back is bent. " 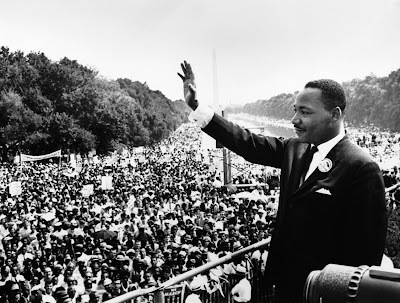 - Dr. Martin Luther King Jr.
Karen: I decided to take a little break from my Deathlok reviews and go down a very strange, unexpected path. Looking through a box from deep in the closet I found a book purchased as part of a sort of grab bag at an antique fair a few years ago. Today's review looks at a Marvelous reprint - Weird Wonder Tales #19, from 1976. This book caught my eye because it proclaimed "special origin issue!" Lo and behold, we have the origin of the infamous Dr. Druid, although his initial title was 'Dr. Droom'! I kid you not. This story was reprinted from Amazing Adventures #1, from June 1961- so this preceded the Fantastic Four and the beginning of the Marvel Age, but not by much. 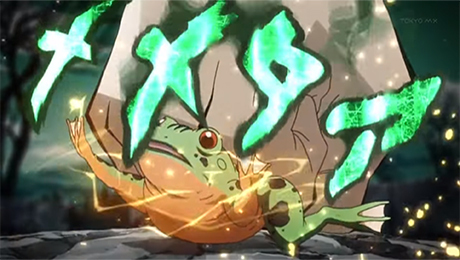 This reprint, however, was re-lettered so that the character's name appears as 'Dr. Druid', just to be consistent with his later appearances. What, you don't remember Dr. Druid? The 2nd rate occultist who actually took over the Avengers as leader for a brief period? Well, you're probably better off for it. Karen: This origin story, which was uncredited, but apparently by Lee and Kirby, is essentially like that of the later Dr. Strange. Dr. Anthony Druid is a medical man who travels to Tibet to treat an ailing lama. He undergoes a series of trials -including facing the unbelievably ludicrous Gorlion (guess what two animals mated to make that!) -and finally reaches the Lama. The Lama is not ill, just nearing the end of his long life. He needed a successor to battle evil mystical forces, and apparently a Western physician was the best option. Karen: The later Dr. Strange version would add elements that would definitely improve the tale, particularly Strange's downfall after the accident that ruins his hands. Of course, the best change to this formula was the addition of Steve Ditko as the artist. Kirby's not bad but Ditko was on a whole other level when it came to mysterious, mystical realms. But it's fun to see this 'trial run' as it were. Karen: There are two more stories in this issue. Only the middle one is worth mentioning, though. The title of the story is, "I Challenged Groot! The Monster from Planet X!" 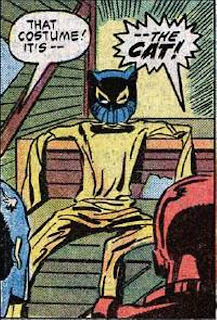 It originally appeared in Tales To Astonish #13 (November 1960). 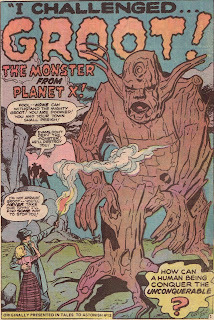 Groot is a gigantic tree-like alien, the Monarch of Planet X, actually, who has come to Earth to experiment on humans. Somehow he plans to wrap an entire village in a net of tree roots and propel it into space, back to Planet X! No, this doesn't make a lick of sense, but who cares? When all appears lost, the wooden despot is finally defeated - by termites! I really could not make this up. Karen: What is so great about this story -besides the utter absurdity of it - is that Groot is still kicking around today! Just pick up an issue of Guardians of the Galaxy and you'll see ol' Groot running around, in a silly uniform, shouting, "I am Groot!" Man, sometimes I just love the Marvel universe. Doug: From the cusp of the Bronze Age comes today's critique: My Love #2 (November 1969) with art by the dream team of penciller John Buscema and inker Johnny Romita. 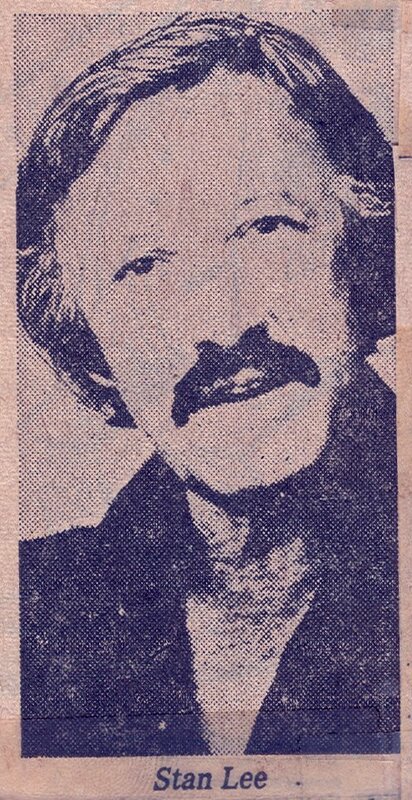 I couldn't find a credited scripter, although some sources questioned whether or not Stan Lee did the wordsmithing. 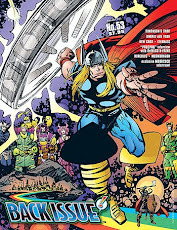 I used the hardcover Marvel Visionaries: John Buscema as my resource for this reading/review. Rarely if ever do I stray from the realm of super-heroes in my comics reading. Occasionally I like to read a Tarzan or Conan; never really cared for war stories and certainly not soap opera comics. So I enter relatively uncharted territory today. But after seeing who the credited artists are on this story, can you blame me? Both of these artists have long been known for their mastery of the female figure, and particulary in Romita's case of the pretty face. This throwaway mag (to me, at least) is a tour de force of these two fine creators' powers. Selfish Faye Randall is her club's best go-go dancer -- for whatever that's worth. Faye's always had a problem with being self-centered -- as a child she received a new doll, but immediately coveted the doll of a friend. As a teenager, she wanted the cutest boy in school to be hers; that is, until another handsome young buck caught her eye. So it was for Faye until the day she became engaged to Marty Lane, a young Rock Hudson with killer sideburns. As Faye fell for him, she found herself reverting to past behaviors when her club was sold to the dashing (and older) Nick Duran. Sensing that she could flirt her way into Mr. Duran's life, Faye ditched Marty like yesterday's whatever. At least she did it to his face instead of in some Dear John letter... Anyway, you can probably predict where this is headed: Duran's married, has no interest in Faye, sells the nightclub which breaks Faye's heart and unemploys her in one fell swoop, and makes her feel like a dope. And what of our hero, Marty Lane? You betcha -- dude skipped town. You go, boy! Probably avoided getting VD from Faye by catching the last train to Clarksville! Part Six: Marvel-ous, or Not? Doug: This is, garish as it looks, a favorite costume of mine. Perhaps it's because it came out somewhat early in my comics-buying career, but it just always stuck with me. 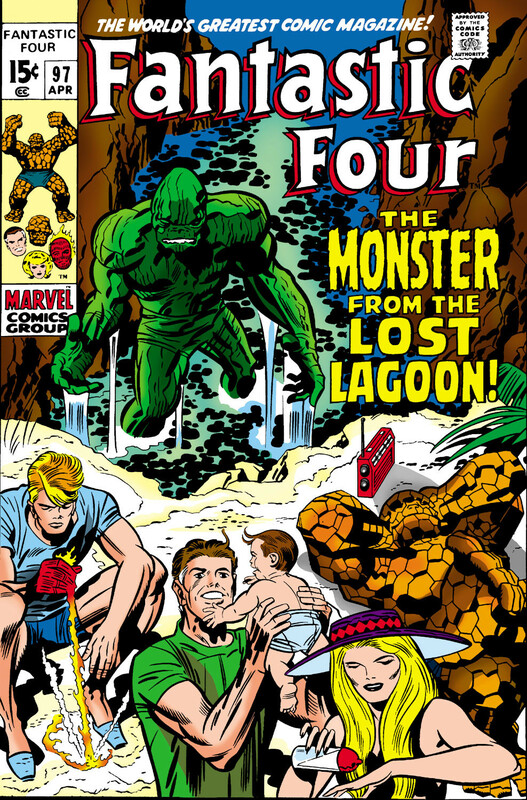 The period in the FF that saw the debut of the Crusader was a nice little run, with the Hulk 2-parter coming right after this and the loss of Ben Grimm's powers, the addition of Luke Cage, and the creation of the exo-skeleton coming even after that. As to the Marvel Two-In-One cover, who read and didn't like the Project Pegasus storyline (soon to be released in a Marvel Premier Hardcover edition)? Doug: I actually prefer the above look (with the blue pants -- no, not with the shorts) to whatever Quasar is wearing these days. I understand that his recent get-ups are loosely based but still an able homage to the original 1950's costume. I liked the headband (and I generally eschew headbands, my friends), the large chest symbol, and the big belt. While virtually none of that may be practical, it had that over-the-top look that comics can get away with. The suit to the right -- something would have to be modified even more were it to see the light of Hollywood day. But not in a four-color comic, baby! Karen: I suppose his original short pants look was much more acceptable to kids in the forties. But a bare-legged hero today looks a little funky. What's interesting is how Quasar's look really began to become more like Captain Marvel (or Mar-Vell as it were) as his powers and role became more like the former protector of the universe. Karen: Of course we also have the original Marvel Boy, Bob Grayson, now running around as the Uranian in Agents of Atlas. But his look is nothing like Quasar's. Karen: All in all, I'd give him a thumbs up. It's hard to go wrong with primary colors and sparkly effects! Doug: OK, so admittedly we've had a mixed bag with our DC reviews. Karen liked a Justice League story she read, and I told you how great Detective Comics #400 was. However, then I had to punish you (and me... whoo-boy!) with that super-lame Brave and the Bold yarn. I'm going to take another stab at it with an 8-pager that ran in Superman #257 from September 1972. I'm pulling this one out of the hardcover The Greatest Team-Up Stories Ever Told (c. 1989) and can honestly say I've never read this story. Let's see how we feel about "The Greatest Green Lantern of All!" by Elliot S! Maggin (off a Neal Adams plot) and Dicks Dillin and Giordano. Here we go -- Green Lantern Corps member Tomar-Re is nearing retirement and is summoned before the Guardians to be told a secret about a planet of his sector, the only time Tomar-Re failed to save a world: the doomed planet Krypton! 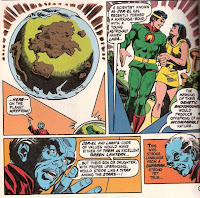 The title of the story, then, refers not to any of the Green Lanterns we know, but to what might have been had the offspring of Jor-el and Lara been enlisted in the Corps! Flashing back, we see a meeting of the inner council of the Guardians where debate rages over making the Corps independent. The major discussion centers on whether or not there is a ringbearer in the universe qualified to lead such a transition to independence. In a few panels that evoke Marvel's Watchers, the Guardians look to the future of potential offspring of the just-married Jor-el and Lara of Krypton. Allegedly genetically perfect, they would produce a child "of an incomparable nature". The Guardians are aware that Krypton will soon explode, and so dispatch Tomar-Re to slow the process until Jor-el (like an alien Noah) can ferry all Kryptonians to safety. We are reminded that Jor-el created not only a Space Ark, but the technology to shrink Kryptonian cities. We also see that Brainiac hijacked the Bottle City of Kandor. Little Kal-el is born in this sequence, and we see Jor-el pleading without results to the Science Council. In the meantime, Tomar-Re is in a race against time to pack the guts of Krypton with a stabilizing element called Stellarium. 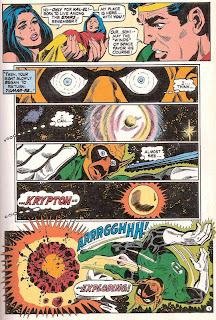 However, in his haste to gather the mineral, he neglects to sense a nova and is temporarily blinded by the yellow radiation of the exploding star. The next two pages are quite exciting, as Tomar-Re uses the ring to guide him to Krypton with his next payload of Stellarium. We see interspersed panels of Jor-el and Lara with the rocket that can carry Lara and Kal-el to safety; Lara of course elects to stay with her husband. Tomar-Re's vision begins to come back to him and as he says "I think I can almost see... Krypton!" the planet explodes. He is nursed back to health by the Guardians and they discuss whether or not saving the planet would have been worth more than the outcome -- Superman's life on Earth and his maturation into the universe's greatest champion. Hot dog! We got a winner here! This was a really interesting story, easily compared to a Marvel of the same time. The art was great – very polished. Giordano’s inks easily swung Dillin’s pencils toward Neal Adams – definitely evoked Adams’ Superman work of the era. And Maggin’s script was nice – not dopey like so many DC’s of the Bronze Age. Karen: Hey kids, I'm back with the next issue of the original Deathlok run, Ast onishing Tales #27 (circa December 1974). This time around Rich Buckler and Doug Moench are credited as co-plotters, but Buckler is credited with art and story, so I guess he actually scripted it. The last time we saw our zombie-cyborg pal Deathlok, he was trying to find his war buddy Mike Travers. He tracks him to the Statue of Liberty, fights his way through a bunch of goons, and then opens a door to reveal his nemesis Ryker, along with a bizarre cyborg werewolf that Ryker calls the War Wolf. Ryker says that the War Wolf is actually Mike Travers, and this creates a dilemma for Deathlok: he can't kill his best friend. However, as Deathlok appears to be on the ropes, Ryker, for some reason, decides to tell him that the War Wolf isn't Travers after all; Travers died on the operating table. Why do villains always seem compelled to do stupid things like this? This of course gives old D-lok a big boost and he battles back, defeating the War Wolf, in particularly brutal fashion. Deathlok, now leaking 'life fluids', decides to get the heck out of Dodge and then makes a rather poorly thought out decision to go see his wife, Janice. 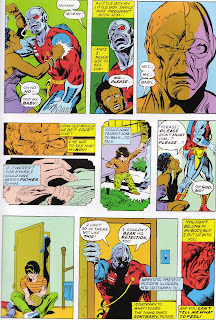 She freaks out when she sees him - it's not really clear that she recognizes him as her former husband - and right before he's about to enter his son's room, Deathlok realizes what a terrible idea this was. He runs outside and in his despair tries to shoot himself in the neck, but his computer makes suicide impossible. He realizes that he can't escape the life he's in, and he can never return to the life he had. This is a pretty good issue, although I get the feeling reading this (and other issues as well) that Buckler was so bursting at the seams with ideas for Deathlok that sometimes concepts and terms are thrown into the book willy-nilly, without much thought. 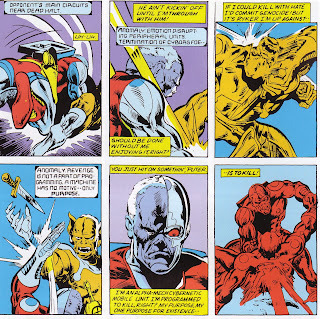 There's a whole page of Deathlok symbolically hanging on a cross, where we discover that the third voic e he had been hearing (the one neither Luther Manning's nor the computer's) was actually an implant Ryker had been using to track the cyborg. Then there's some talk about him feeling persecuting and Ryker trying to make a god machine - honestly, it seems sort of crammed in there. I know what Buckler is going for here but it seems a bit ham-fisted. Ryker is also a difficult character to take seriously, as he is so over the top and manic in every scene. His motivations are vague; at one point he says, "I use people to create the future. My ultimate goal is to gain mastery over life...and finally, death." Well, that's a fairly vague statement that probably would work for some villains, but in a more realistic series like this one it just comes across as almost lazy. It doesn't help that he just seems (and looks) like a crazy cybernetically obsessed Thunderbolt Ross! The last negative I'll mention, and this is an odd one, is the lettering. I almost never even notice lettering in a book, but the job done in this issue is very poor. Desmond Jones is credited as the letterer and I do n't recall his name at all. In any case, it's very light and inconsistent. On the good side, the fight pages are pretty well done, although much more violent than most of the comics of that time. But the best part of the book is towards the end. The sequence with Deathlok returning to his former home is just gut-wrenching. The loss that Manning feels is palpable and really helps to make him more sympathetic to the reader. An interesting aside: Manning was a Caucasian, and his wife Janice is black. 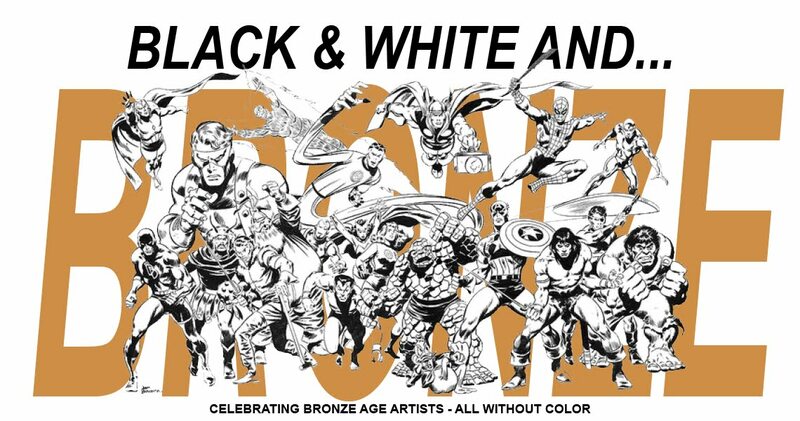 There are so few inter-racial couple in comics, and this was certainly the first time I can recall seeing one. The attempted suicide is also moving. To see him, our protagonist (I can't quite call him a hero) turn his laser gun on himself is still shocking today.